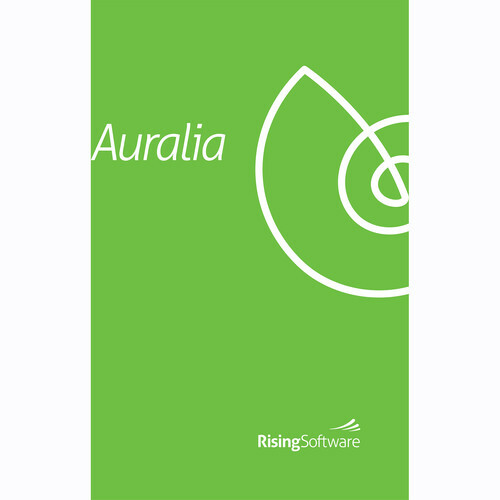 Auralia 5 Cloud Edition from Rising Software is a comprehensive ear training software that uses real music to teach musicians how to imitate, compare, sing, identify, and transcribe various musical elements. It offers students of all ages and abilities a drill-based approach to contextual learning, and a fun, engaging way to practice, while giving teachers powerful tools to create customized syllabuses, set tasks and assignments, run exams, and track and assess the progress of their students. This annual Cloud Edition license provides flexible usage, allowing students to practice ear training at school, at home, or on the go. Auralia 5 comes with 43 topics divided into five groups: Intervals & Scales, Chords, Rhythm, Harmony & Form, and Pitch & Melody. Each topic has an accompanying lesson module in which students can learn to identify chords in their favorite songs, transcribe solos, improve their improvising, play by ear, sight sing with ease, and more. Teachers can use the included library of audio recordings and common-repertoire notations or import their own content, to create high-quality questions for their students. The clean and elegant interface is designed to provide students with feedback while keeping them focused on the essential ear training tasks. The software provides carefully sequenced levels that gradually introduce students to more difficult drills, allowing them to learn at their own pace. It also records students' activities such as what they studied, when they practiced, how long they practiced, and how they scored. Summary and detailed reports showing student progress can be easily generated and reviewed by both teacher and student, with no grading to be done. Note: This product is an educational discounted version available to qualified, accredited academic institutions only (not for individual teachers or students). Proof of current educational status is required. A Cloud License has a minimum of ten (10) students, and can be used on computers within the school or at home. Pricing is per student/license, and is for an annual subscription. All student records are stored in the Cloud.